Packaging matters for customers-see how and why ! Why packaging matters and how to make a difference? You start a business, you create your products and start selling them. You invest in marketing, advertisement campaigns and events in order to reach more people and potential customers and finally it starts to pay off. Orders start to rain and packages must be sent everywhere around the world. This is probably the most crucial part of the process of selling. It is the moment when your product reaches the customer. And it has to be intact, it has to be perfect. Why the packaging is that important? The unboxing part has become a critical part of the customer experience. It has been highlighted in the recent years as more and more people start to film the process. Why you ask? Remember the times when you used to believe in Santa Clause and the excitement of unwrapping the Christmas presents kept you awake the whole night before? That is why! Around 45 % of surveyed people say they are more excited when receiving their order in a customized wrapping*. People feel exactly the same when receiving your product. Youtube reports that viewership of unboxing videos is up 57 % since 2016. Well, unboxing a product in front of a camera lets viewers see your packaging before the product inside and as we know it very well, 1st impression matters big time! 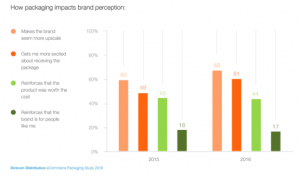 As several studies have shown, packaging directly affects brand and product perception. If the wrapping is nice and “flawless”, there is a good chance that the customer has a very good first impression of your brand even though he hasn’t tried whatever product is wrapped inside. It gives the impression of attention to details. 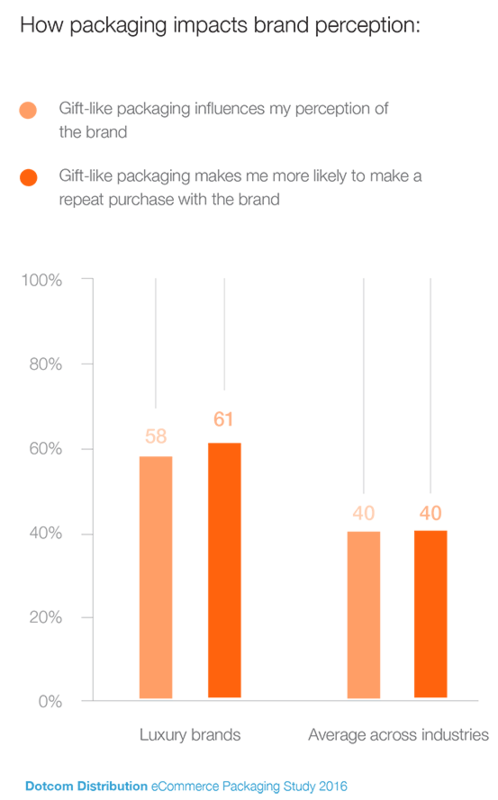 On the luxury goods market 61 % of the surveyed people say they are more likely to do a repeat purchase with the brand thanks to the “Gift-like” packaging. They feel special and like if almost treated as VIPs. 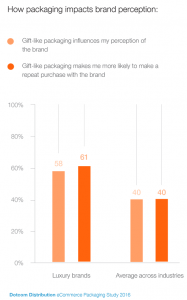 58% say that ‘’Gift-like” packaging influences their perception of the brand. The average percentage for other industries is around 40%. If we want to get deeper into data, 60% consider the brand to be more upscale when the packaging is nice and customized. Looking at these numbers it becomes obvious that packaging is an essential part of your products and in some cases the ambassador of the brand. It’s very likely that this trend is going to increase in the coming years as more and more brands try to differentiate and make a space for themselves on a highly competitive market. Another important effect of highlighting the online live unboxing is the so called “word of mouth” – one of the most effective marketing tactics ever. Nothing sells better than a satisfied customer and his recommendation. 50 % are ready to recommend brands using gift-like packaging and 18 % feel reassured that the brand is for people like them. Pretty good figures, right? In order to get there, you need to think about your packaging first. Of course, you don’t need to know everything about packaging and how it it’s created. You just need initial inspiration and a good printing partner, ready to help you create packaging art! Don’t forget to read our recent article on the top 3 most important elements to consider when creating your packaging. Tagged as advocacy, customer, gift, packaging, printing partner.